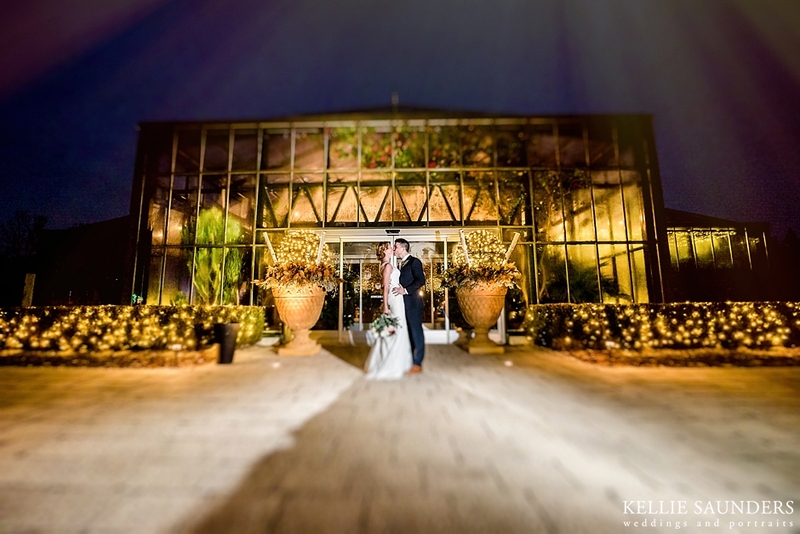 Metro Detroit Michigan wedding photography at the elegant Planterra provided by Kellie Saunders and her team of creative Detroit, MI wedding photographers. This wedding was photographed by Kellie and Jen together. Jen is a remarkable lead wedding photographer, please check out some of her weddings by clicking HERE. She is available for weddings as a lead shooter, so please inquire for your wedding date. Oh Planterra, Planterra, Planterra ... I know I've said it before in many previous blog posts, but I feel that I can't say it enough. I simply LOVE working at this venue! Planterra is one of my favorite places to photograph a wedding. From the attentive and energetic staff, to the delightful and stylish handmade floral arrangements, to the masterfully prepared food which will take over your pallette in a good way. Planterra offers an elegant, spectacular and one of a kind wedding day experience to couples and their friends and family. I simply will never tire of working there. Genna and Justin's wedding day began at the Baronette Renaissance Hotel in Novi which is a great starting point as it's close to Planterra. Genna and Justin prepared for their day at the hotel, but planned on having their first look at Planterra. If you are having your wedding at Planterra we definitely advise you to have a first look so that you have time to really use the venue to it's fullest potential for your wedding day photographs. This is a personal decision and one we can discuss with you, but we definitely suggest taking a look at your timeline if you want some of these images as we can really only do it when the venue is empty, which is before your ceremony takes place. After Genna and Justin were ready they made their way separately over to Planterra where they saw each other for the first time. It was such a sweet and loving moment as they chose to be alone. We stood back and photographed from a distance, and I can't help but smile when I think their first look. We took wedding day photographs for their bridal party and even finished up with the family formals before their ceremony, so that way once the party started, Genna and Justin were free to party! And party they did! What an absolute fun time they had and trust me they tore up the dance floor. Join me in wishing them a happy life filled with love and laughter! I enjoyed every single part of their wedding day and can't wait to return to my favorite venue ever - Planterra! Metro Detroit Michigan wedding photography at the Royal Oak Farmers Market provided by Kellie Saunders and her team of creative Detroit, MI wedding photographers. You can view Antuan and Jessica's engagement session by clicking HERE I can't smile enough or say enough good things about this special couple! Jessica and Antuan are two of the kindest, most compassionate and FUN people I've had the pleasure of working with. We had such a good time working with them on their wedding day, everything was smooth and fantastic! We started the day in Royal Oak at a little airbnb Jessica rented. After the girls put the finishing touches on their hair and makeup we headed over to the Royal Oak Farmers Market for Jessica and Antuan's first look. They opted to have their first look in Royal Oak near the Farmers Market to save time for photos and also because they wanted to make sure there was plenty of time to spend with friends and family after they said their vows. After we completed their wedding day photographs at the Royal Oak Farmers Market we went right into the ceremony and there wasn't a dry eye in the house, including my own. It's difficult to photograph a wedding with tears running down my face, but somehow I made it work. Jessica and Antuan danced the night away and before we left they went outside with me for a couple of night shots by the fountain. I always love getting something extra special for my couples if we can. Join me in congratulating Jessica and Antuan and wishing them a lifetime of love and laughter! Engagement Pictures in Birmingham with Jennifer and Nate were taken by Kellie Saunders, a Birmingham, Michigan wedding photographer. I really loved working with Jennifer and Nate to help them capture some loving and fun moments to celebrate their engagement. They came in from out of town, so we shot in midday sun. I love this gallery as it's a perfect example that shooting at high noon isn't something to be feared. As long as photographers understand the direction of light we can shoot in full sun and still get stunning results. I had an absolute blast working with them and as you can see from the images we captured below, I think they had fun too! Jennifer and Nate were married at Lazy J Ranch in Milford later that summer and I'll post their wedding images soon. 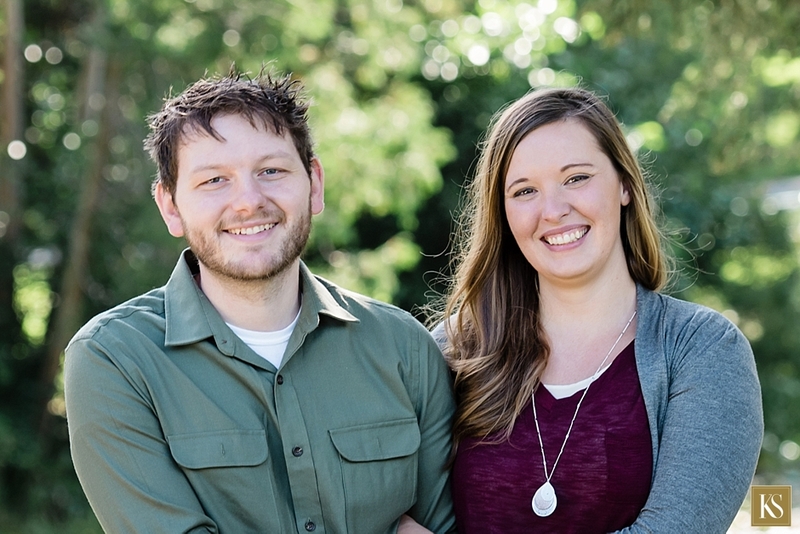 Check out these gorgeous engagement pictures taken at Quarton Lake in Birmingham, MI below. 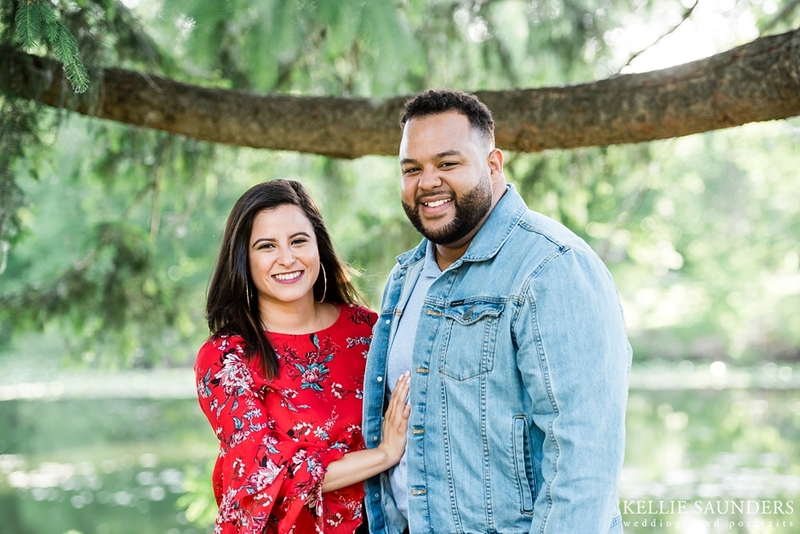 Birmingham, MI engagement photos at Quarton Lake provided by Kellie Saunders, a top Detroit wedding and engagement photographer. I'm a bit behind with blogging these days as it's just busy, busy, busy here at the studio with bookings and meeting new couples in the colder winter months. One of the first things we do is set up our engagement session and I love showing how beautiful the parks are in my area. Alicia and Nick met me in Birmingham at my usual spot and we had so much fun celebrating their engagement with pictures! Alicia is a natural beauty, both inside and out Nick, well he's pretty handsome too. What I loved hearing about during our session was their story and how they met at work and fell in love. These two laughed and shared a great afternoon with me. Their chemistry was off the charts fun! It might be cold outside today, but here's an engagement session from warmer days to help lift you from those winter blues! Engagement Pictures in Birmingham with Payton and Janiris were taken by Kellie Saunders, a Birmingham, Michigan wedding photographer. Okay I can't tell a lie here, in all the years I've been in business, I've probably never laughed so much during an engagement session as I did with Payton and Janiris. I admit that I sometimes bust out in song while working with couples (yes I sing to my people), but for some reason I just couldn't stop singing on the day I photographed Payton and Janiris. They were so welcoming, down to earth and lively that I couldn't help myself. When I started singing Payton actually cheered me on! Honestly, as silly as it sounds, it was just good old fashioned fun and it helped create authentic laughter and energy between the two of them and soften the photography process. We photographed at some of my favorite spots in Birmingham. If you are looking for some Metro Detroit engagement picture location ideas Birmingham is a great option. There are plenty of beautiful local parks that are quiet with soft light and gentle foot traffic. In addition to that the downtown area is really fun and lends a hand to some great opportunities for a different look. I really enjoyed getting to know Patyon and Janiris during their engagement session and I can't wait for their August wedding at the Madison Building in Detroit. It is going to be simply amazing with two lovely people, inside and out!! !